Perhaps I should back up a bit. The Norwegian town of Longyearbyen, on the island of Spitsbergen (part of the Svalbard archipelago), is located a mere 800 miles from the North Pole and therefore sits comfortably inside the Arctic Circle. This means that it experiences four months of total darkness and four months of continuous sunlight. In winter, it can get down to around -20° outside, though it’s often colder. At the height of summer, the average temperature is a positively balmy 6°. It’s a town of approximately 2,000 people, over a quarter of whom are employed by Store Norske, the Norwegian coal mining company. Looking at photos online, the town seems to consist of a single row of brightly-coloured, Scandinavian-looking wooden houses, surrounded by a lot of mountains. Pretty, but a bit sparse in terms of human occupation, or things to do. 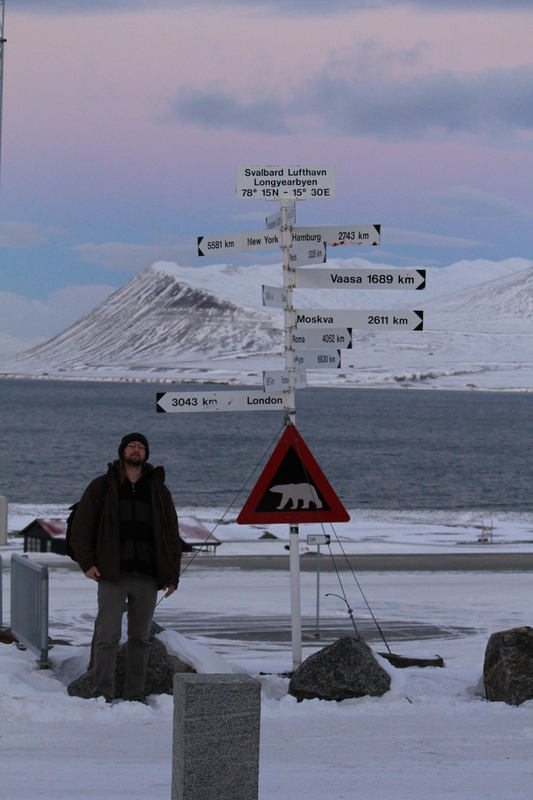 In short, Longyearbyen is a bit of a shock. 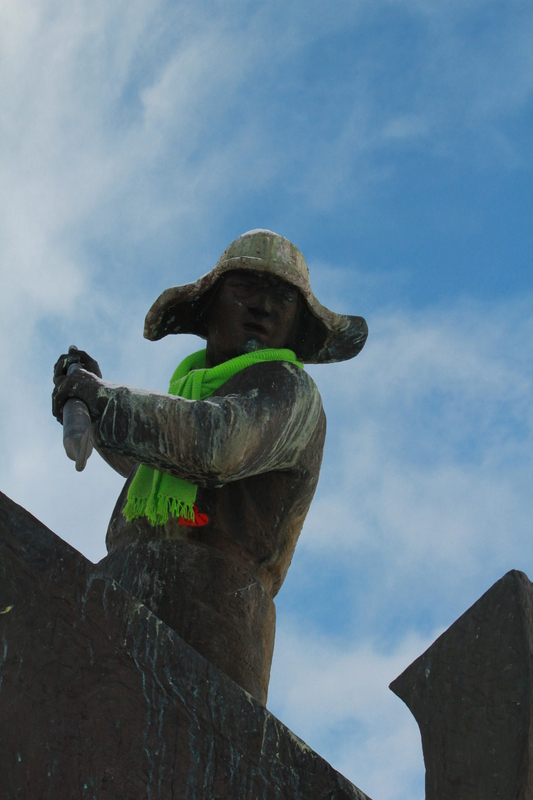 Even without the excitement of the festival, the town has plenty to offer. The hotels are plush and cosy; the bars are well-stocked and serve gourmet food; the scenery is breathtaking and there’s plenty to do if you’re willing to brave the cold. You can try out dogsledding, take a boat trip up the coast, look for the Northern Lights, and – if you’re feeling particularly adventurous – walk up one of the many snow-covered mountains. However, the latter is best done in the company of an armed guide: polar bears outnumber people in this part of the world, and leaving the safety of the town without a rifle is not recommended. If you prefer to stay in the warm, the shopping centre and main street have a range of beautiful things available to buy, including jewellery made locally, fur products (also made and, er, apprehended locally) and a lot of high-quality clothing suitable for the local climate. When you’re done shopping, the Fruene café can provide a variety of hot drinks, homemade food and cakes, and gorgeous handmade chocolates in the shape of polar bears. In the evening, I recommend either Svalbar or Kroa for the kind of meal that would put a lot of central London restaurants to shame. Alcohol is expensive in Norway, but as Svalbard is a tax-free zone, the prices are comparable to London. If you’re feeling too lazy to leave your hotel, however, you can order fast food from Classic Pizza, who deliver up til 3am (or 5am on Fridays and Saturdays). Of course, staying in means that you won’t have much chance of seeing the local wildlife – hang around outside at about midnight and you may well spot a fearless little arctic fox raiding the bins, for instance. Longyearbyen is remarkably normal in so many ways – children play in the quiet streets and people walk their dogs (almost exclusively huskies, admittedly). Yet there are subtle differences which, like the fur products mentioned earlier, may not sit well with some. For example, the town has a very good supermarket, which sells a variety of products available in supermarkets all over the world. However, whale meat, along with seal and reindeer, is part of the northern Norwegian diet and visitors from further south should expect to see it on offer in shops and restaurants. Much less controversial is the tradition of taking your shoes off when you enter certain establishments, such as hotels and museums. These places provide somewhere to stash your coat and boots, and the buildings are always warm, so it’s no real inconvenience to acquiesce. Looking out towards the frozen shoreline backed by imposing mountains against a clear blue sky, it’s easy to see why people move to Longyearbyen. Aside from the amazing scenery, there is a strong sense of community here despite the relatively high turnover of residents (many people come for seasonal employment or to study at the university centre). It’s like nowhere else I’ve ever visited, and despite its remote location is surprisingly accessible, with flights from London Gatwick going either direct to Tromsø or via Oslo, and a short onward flight to Longyearbyen from there. 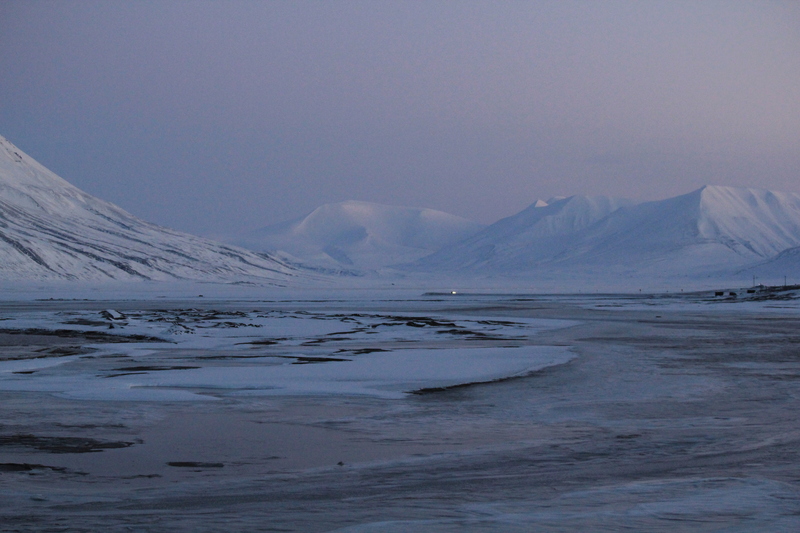 The Arctic: wild, inhospitable… really cold. Probably not your first choice for a holiday destination. However, Longyearbyen – a town situated on the Norwegian island of Spitsbergen, around 800 miles from the North Pole – provides a cosy haven in the middle of the frozen wastes, and an excellent base from which to explore said wilderness. Visiting in late October, you can expect temperatures anywhere between -5° and -20° – which, for a certain type of hardy outdoors person, means it’s time to grab a rifle (in case of polar bears) and trek out of town and straight up the nearest mountain. But what to do if you don’t fancy such a high level of physical exertion and danger on your holiday? Well, you could go dogsledding. 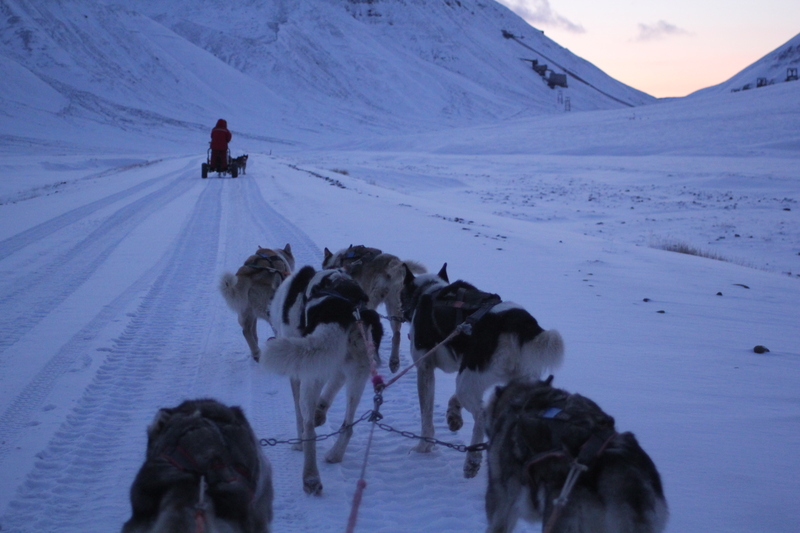 You can book a half-day’s sledding through Svalbard Villmarkssenter, which keeps a husky centre just outside the main town. For NOK980pp (a little under £100pp, although turning up in the off-season will get you a considerable discount) you can take it in turns to ride in and drive a two-person wheeled sled along the snowy Adventdalen and Endalen valleys, taking in the starkly breathtaking beauty of the surrounding mountains and marvelling at the ease with which a complete novice can control a sled powered by half-a-dozen extremely boisterous dogs. The cost includes the loan of some extremely warm outerwear (think of it as a kind of ultimate onesie) as well as mittens to go over your gloves, providing a much-needed additional barrier against the wind chill. As part of the afternoon’s sledding experience, I helped to fetch the dogs out of their enclosures and harness them to the sled – during which I was repeatedly told that the huskies were working dogs, and gently chastised for my timid and over-cautious handling of the animals. Sled-dogs like nothing more than running across the tundra, and if you aren’t firm with them they’ll be out of the door without you. I sat in the sled during the first half of the outing, and while it was nice to snuggle down and take photos, I preferred actually controlling the sled. It’s a lot easier than it looks, especially as the dogs have been trained to follow the lead dog, so my only real responsibilities were making sure the sled didn’t veer off course and remembering to apply the brakes when changing drivers (again, the dogs will leave without you if given half a chance). As a bonus after returning and putting the dogs safely back in their enclosures, the centre provided hot drinks and some time to get enthusiastically clambered over by half a dozen playful husky puppies. If you’re feeling a bit more adventurous, the villmarkssenter also offers day trips by boat up the coast. 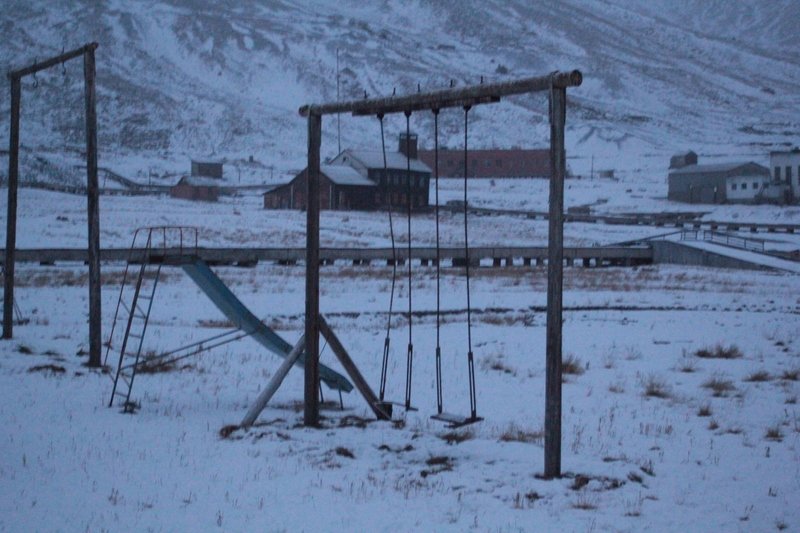 One such trip takes you up to the former Russian mining settlement of Pyramiden, which was abandoned almost overnight back in 1998, its 1,000 inhabitants told that they had 48 hours to vacate and could only take two bags with them. Now there are just a handful of ‘caretakers’ maintaining the empty buildings, and arctic foxes scamper without fear along the silent streets. 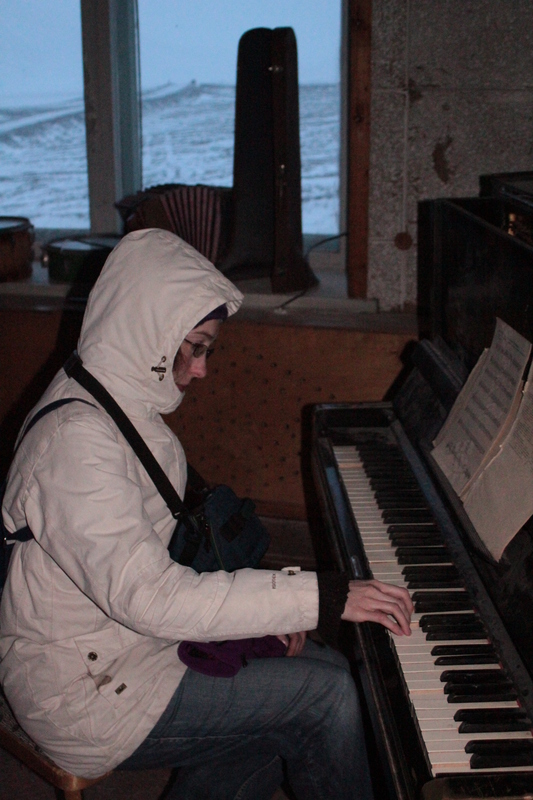 Unsurprisingly, there are several “world’s most northerly” items to be found at Pyramiden, including the northernmost bust of Lenin and the northernmost piano (which was less out-of-tune than I expected and still had an open exercise book sitting on the stand). But what I found most unexpected was the lack of obvious decay – it’s just too cold most of the year for that. There’s no woodworm chomping through the furniture, no mould creeping up the walls, no smell of decomposition. The air inside the buildings is dry and still, but not stale. 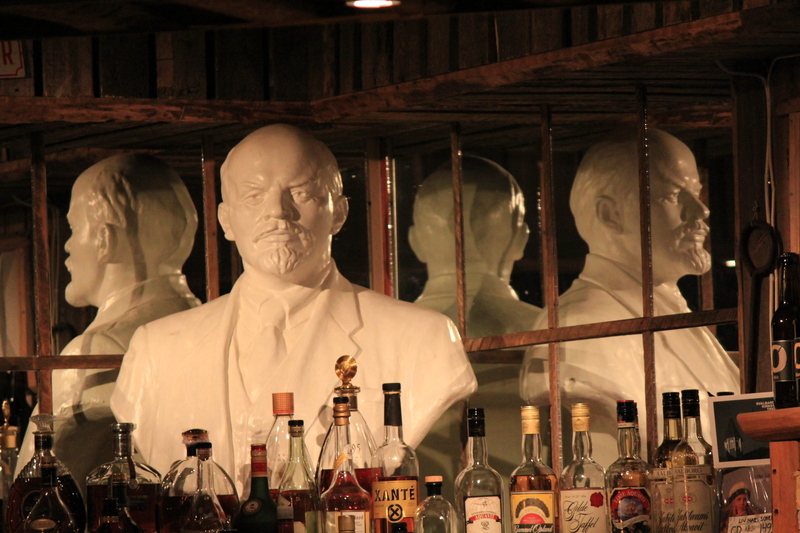 For the most part, the place could have been vacated last week. There are even two balalaikas sitting in the music room that seem to be in need of nothing more than a new set of strings. The boat takes a good three hours to get to Pyramiden from Longyearbyen, but there’s plenty of seating inside and the onboard bar offers a variety of drinks, snacks and waffles. Also included in the price is a lunchtime barbecue, which coincides with reaching the Nordenskiöldbreen glacier. The food is very good but not exactly vegetarian-friendly, and some might be offended by the presence of minke whale-steak on the menu. Is there anything sadder than an abandoned playground? The trip to Pyramiden, at a cost of NOK1450 (a little shy of £150), is definitely at the pricier end of what I would pay for a one-day excursion. However, given the amount of time you’re out (around 8am til 6pm), the knowledgeable patter of the guide, and the relative inaccessibility of the sights you’ll see during the day, it’s worth the expense. Wandering around the ghost town provided a much more intense experience of the history of the place than just viewing artefacts in a museum would have done. 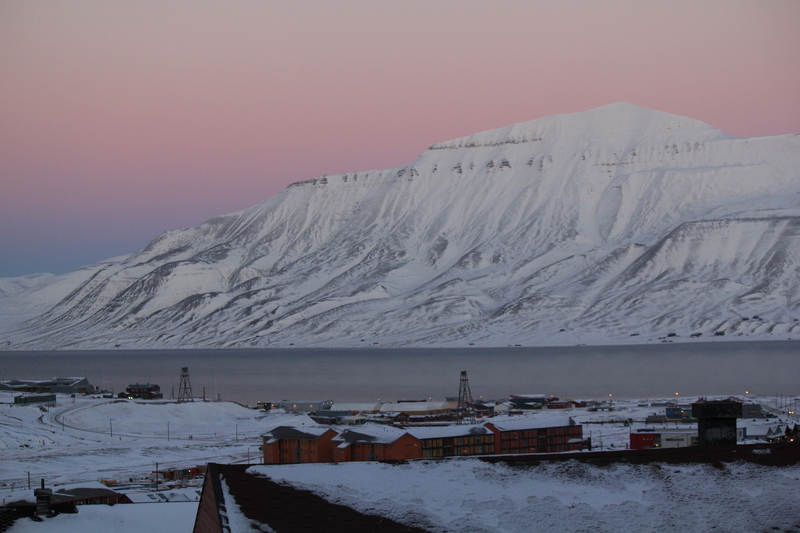 The image of a thriving community in such a remote part of the world, contrasted with the emptiness of the town today, is quite haunting, and the warm glow of streetlights as the boat approached Longyearbyen was both welcoming and comforting. Tromsø is a beautiful coastal city in Arctic Norway. 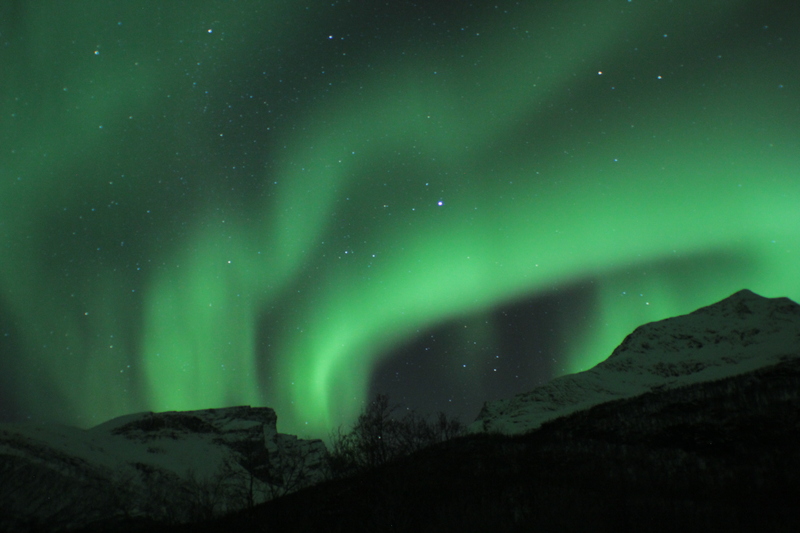 A great place to explore by day, it’s also perfectly positioned to see the Northern Lights. However, to catch a really good display you must have clear, dark skies as well as strong solar winds, so arriving in snowy October (as I did) during the quietest “solar maximum” in at least a century meant that some perseverance and luck would also be required. It’s best to get far away from any kind of light pollution when looking for the aurora, and to this end I made my way to the Rica Ishavshotel on Fredrik Langes gate to book myself on to an “aurora chase” with Northern Shots Tours, who operate out of the hotel’s lobby. These tours are literally aurora chases, so be prepared for a lot of time on the road – the tour guide will drive you to Finland if that’s where the clearest skies are that night, and you might not get back to your hotel until the wee small hours. You may find yourself hanging around in subzero temperatures for an hour or more at a time, gazing in wonder at the sky and taking photographs with increasingly numb fingers, so be sure to wrap up warm. If you plan on taking photos, I recommend a wide angle lens, a spare SD card and more importantly a spare battery, as prolonged exposure to low temperatures really saps the charge. 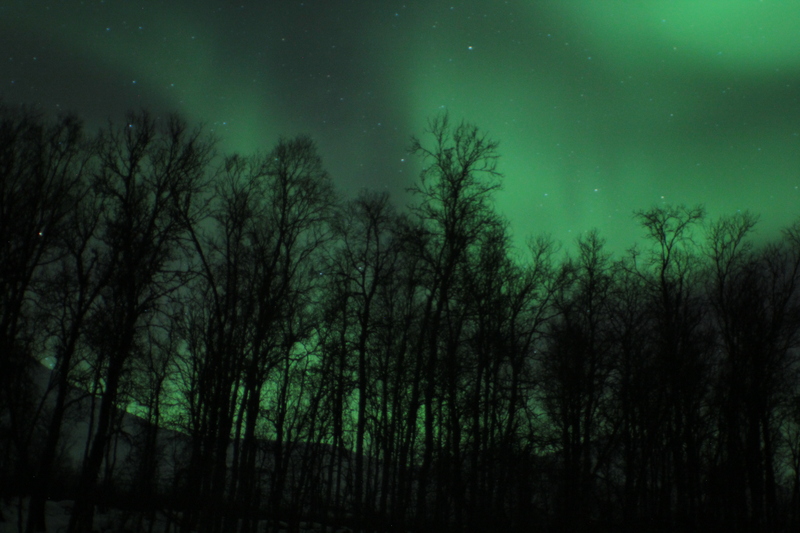 Most important of all is a tripod – you will not get a good aurora photo without one. If you need tips on how to get a decent shot, the tour guides are professional photographers and more than happy to offer advice. 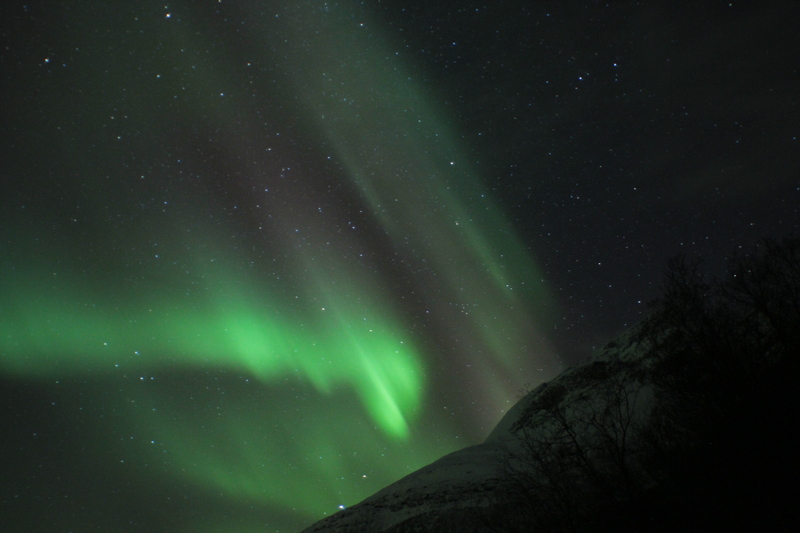 As I found out, “chasing” can be addictive – I spent three nights in Tromsø and was out looking for the lights every evening. At NOK950 (around £100) per tour, this can quickly get expensive. However, if you want to maximise your chances of seeing some amazing displays, it’s worth paying out. On my first tour, we drove almost to the Finnish border in a bid to escape the snow clouds. Right before we were due to head back to Tromsø, the skies cleared, revealing a magnificent starfield and a diffuse green glow. Nice enough, but not exactly what the Internet had promised me. The second night (half-price due to yesterday’s lack of aerial drama) was entirely cloudy, no matter how far we drove. The guide tried all of the usually good viewing sites he knew, but despite spaceweather.com’s insistence that solar activity was high, we saw nothing at all. Third night, and my last night in Tromsø. I stomped down to the hotel, fuelled by a determination not to head back to London a Northern Lights failure. The group of hopefuls gathered in the lobby was much smaller this time, but there was an undercurrent of anticipation as people checked the weather forecasts and grinned at each other. We were barely beyond the outskirts of the city when those sitting on the left-hand side of the minivan started pointing at the sky. Sitting on the right, I bounced anxiously on my seat as the guide looked for somewhere to pull over. Within a few minutes we were hurriedly setting up tripods in an unlit lay-by. I gazed up at the sky, which was streaked with huge, gently undulating ribbons of green light. We watched for a while and took a few photos, but we were by the side of a road and the occasional passing headlights were somewhat distracting, as well as being ruinous to long-exposure photography. Our guide was confident that the aurora were just getting started, and that we would have a much better view if we drove around to the other side of the mountains. Approximately half an hour later, we were standing in a darkness wholly unspoilt by artificial light. The reason I could still see well enough to set up the tripod is because the aurora had lit up the landscape. There was so much happening in the sky, so much movement, that I didn’t even try to take photos at first. It didn’t matter where I looked: one way, vast swathes of green light rippled across the sky; turning around, I saw vertical beams projecting straight down and flashing rapidly on and off. Directly overhead, curtains of green and purple seemed to be falling on us. It was spectacular and breathtaking – and I really needed to snap out of it and start trying to get some photos. But where to focus? Point the camera one way to get a beautiful shot and you’d miss two equally gorgeous pictures elsewhere. The fantastic display seemed to last for half an hour before beginning to quieten, although the lack of sensation in my feet suggested we’d been out a little longer. On the ride back to the hotel I checked the times of my photos: we saw around four hours of aurora borealis tonight. Fatigue, numb extremities, a traumatised bank account… none of it matters, such is the euphoria that comes with finally seeing the Northern Lights.